Just tack the legs into place so that when they aren't lined up properly, you can replace them easily. He's not perfect, but I'm not moving those legs again. I just couldn't get them any better! They're sewed on tight this time. 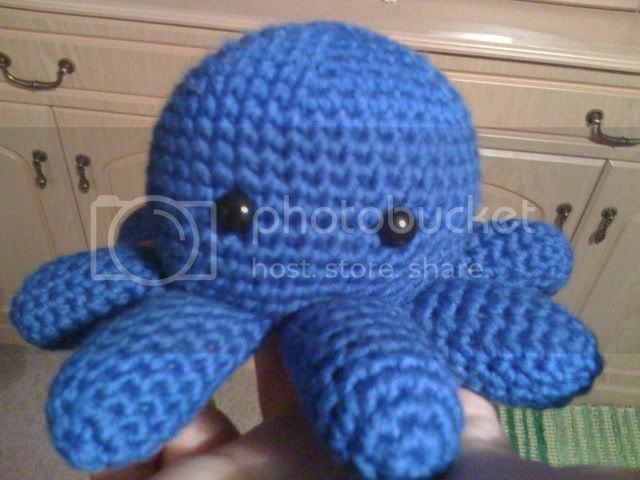 My lovely blue octopus has plastic hacky-sack-type beads in his body/head, and aquarium filter wool in his legs (I upgraded my aquarium filter and no longer need the excess wool... figured it may as well go to a good cause!) I put both of the types of stuffing materials into a cheap nylon stocking first to keep the beads in place, and so that the whiteness of the stuffing didn't show so clearly. I'll do it again next project too, it's useful, especially for the beads. 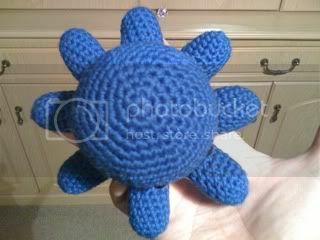 Used a 4.0 hook for this, and about half of a 50g ball of wool which had a recommended needle size of 5mm. And two plastic safety eyes. Anyone know why they are called safety eyes?